The organ was built in 1863 by J.C.A. Kruger for St Michael's Lutheran Church, Hochkirch (Tarrington), Victoria. It was removed in about 1929 and used in a private residence in Ballarat. 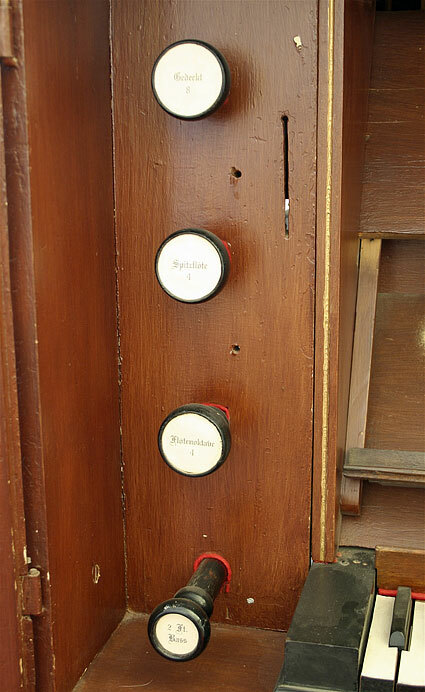 The organ was restored and installed in its present location in 1997 by Roger Jones (Nuriootpa). 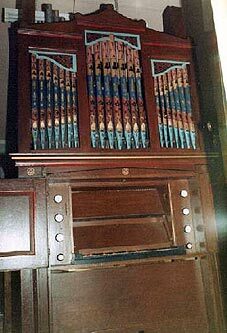 This organ is a rare example of the Silbermann-style positiv organs built in Australia by German expatriates. The Museum is in the old Tanunda Post Office. Both the 2 Ft Bass and Viole 8 are smaller stop knobs to the others, suggesting changes from original. 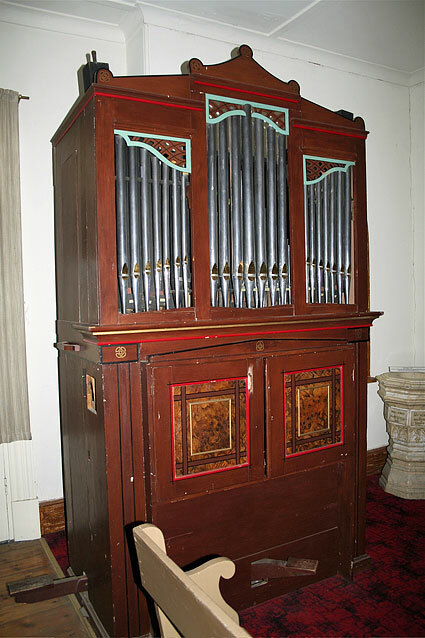 The organ currently in the Museum in Tanunda is recognised as the second organ built by J.C.A. Krüger. The involvement of Krüger’s descendents helps identify the instrument though the date of its construction is unclear. 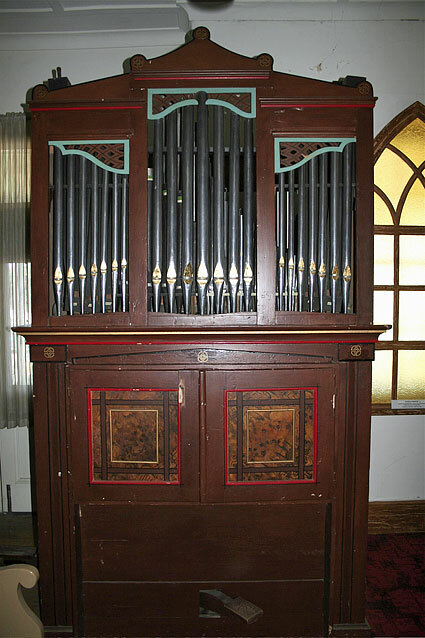 After its initial deployment with the church at Hochkirch (later named Tarrington) in Victoria, and use as a residence organ, it had a somewhat turbulent history before finding its current location. J.C.A. Krüger arrived in Western Victoria in mid 1855 from South Australia.1 His eldest son Carl and members of the extended family had arrived four years earlier. They settled to farming at Hochkirch with land later at Lake Linlithgow near Hamilton. Kruger died in 1871 and is buried in the Tabor cemetery. 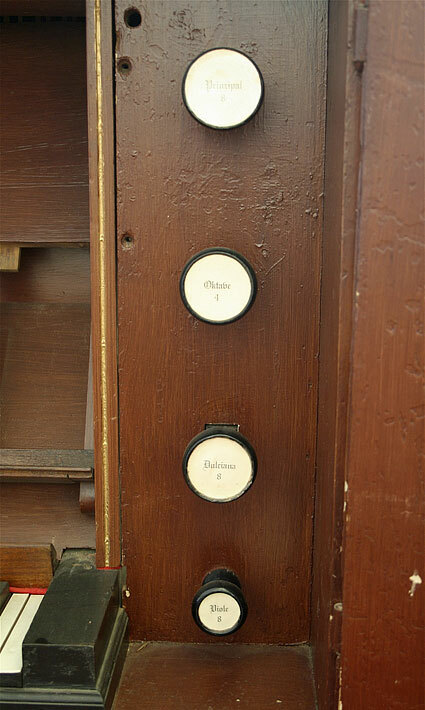 It is not clear when, or for which church building, Krüger made the organ. Even the family history is confused. At one point it states: “whilst at Hochkirch J.C.A. built an organ for the first church. The church was built in 1863 … and named St Michael’s.”3 This ignores the existence of the two former church buildings. Assuming the date to be in error this would allow for construction between Krüger’s arrival late in 1855, and 1858 when the second church was built. In 1863, Krüger would have been aged 63. However, the organ was then said to have been built “in about 1863 … of local hand carved timber and contained 260 pipes of wood and metal”. “Purchased by the congregation for £80” it was “in constant use for 65 years in the first and second churches, till it was replaced in 1928”.4 Clearly for this statement to be correct either the organ was built for the third church and was not in either the first or second churches, or the organ may have been built for, and served in, the second church as well as the third. It again ignores the existence of the 1854 building. The sequence of events over the next two decades is not clear. 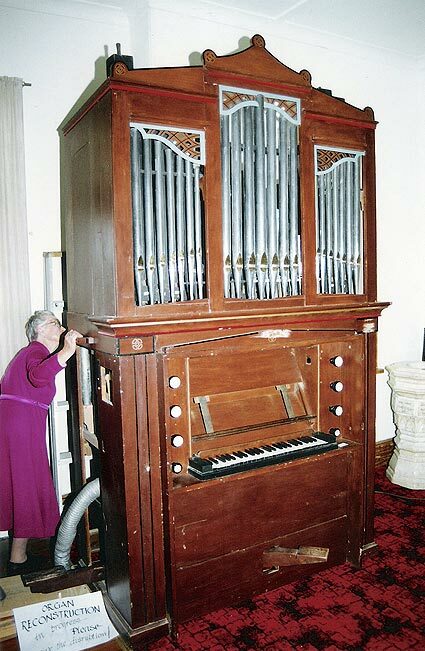 It would seem that the organ came into the possession of a Mr Winkler of Ballarat and became a centre of controversy. The Krüger family wished to buy the instrument back, but Mr Winkler was not inclined to sell or even communicate with the Krüger family.6 Nevertheless by 1980 the organ was to be found in the barn of Brian Nagorka of Penshurst, a descendant of Krüger (through his second son Gustav)7, and incidentally neighbour to OHTA member Tony Wilson. There the parts were systematically sorted in his barn and fully documented by John Stiller”.8 Ownership now resided with the Krüger Family Trust. Between 1981 and 1985 the organ was restored. Initially Doug Price of Geelong rounded out the metal pipework and renovated the pallet pull down mechanism. The work was then handed over and completed by Leighton and Sheila Turner of Ballarat. The diagonal bellows and feeder were re-leathered; the windchest and action were fully refurbished and missing sections of casework replaced. The diapering of the pipes and overall scheme of decoration was restored by Sheila and the stop names and labels reconstructed by Leighton.9 A new home was found for the organ in the gymnasium of the Good Shepherd Lutheran College Hamilton. Perhaps the potential for damage was recognised. 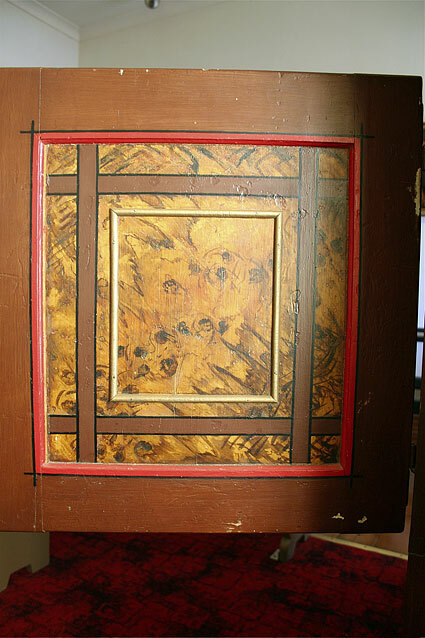 By 1989 Pastor Mark Whitfield, then at Tarrington, had it removed and brought back to the manse. 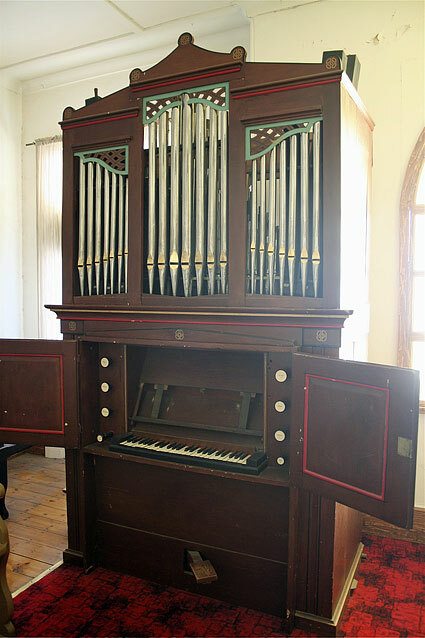 After consultation with some of Krüger’s descendants and their subsequent agreement, the organ was brought to the Barossa Valley where it was kept until it could be restored in 1997 and relocated to the Tanunda Museum. 1 Reference to Krüger should be read in conjunction with the organs at Bethany and Stockwell. 6 Naylor op cit p.102; according to a letter from John Maidment to Bruce Naylor dated 22 April 1970, Mrs Sophie Mirtschen, also a Krüger descendant (Krüger Family Committee op.cit. p.65) had sought to obtain the specifications of the organ from Mr Winkler to no avail.